Smart Destination can capture, process and correlate a huge amount of live data generated around the city where the user is located. Smart Destination provides an optimized route in real time to offer the best experience so you can enjoy the best vacations of your life. Make the most of your holiday time. Smart Destination make smart routes depending on your taste, money and time available. The application provides you with an intelligent route, in real time, to enjoy holidays as you desire. The user is able to select their preferences, budget and available time and the app creates the route that maximizes the experience. All of this, in terms of data correlated from the city sensors, the Open Data portals, booking web sites, internal systems of the city council, information systems of the Point of Interest (POIs), the social media and other data of interest. We analyze data to help the governments of Smart Cities in the decision making, in this process of city transformation to become more efficient, coherent, innovative and self-reliant. Smart Destination it is not only a list of places to visit, is much more. 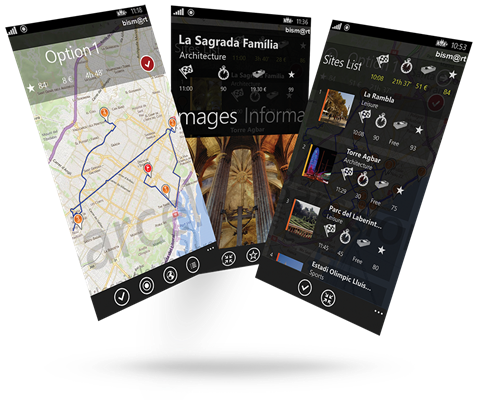 It is a personal city guide in your mobile phone. Smart Destination optimizes your time, it saves you money and improves your vacations to achieve the best experience in the city. This solution that manages the touristic sector, helps the authorities to offer better services to the citizens and improve the public services management such as the mobility, accessibility and transport, infrastructure, security, emergency, cleaning, etc. The application allows to shape the touristic flows to different points of interest that the city offers, decentralizing those which can get over-cowded at any given time. Smart Destination is a powerful tool to transform the tourist model to attract the desired visitor target. Thanks to Smart Destination, now it is possible to reach a cultural and quality tourism.